Find hotel near Knocknagoshel Shooting Gr .. 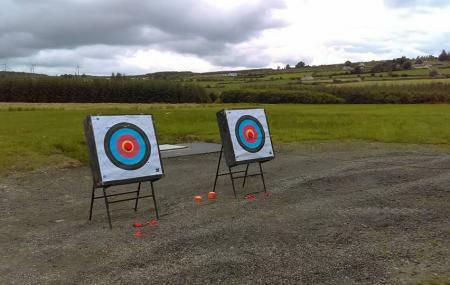 If you are looking for an interesting thing to do this weekend, why not try your hands-on shooting at the Knocknagoshel Shooting Grounds in Ballyduff. A perfect place for first-timers and professionals alike, this place offers a wide range of guns, shotguns, pistols and rifles. Located at the gateway of Kerry, this place caters to sport fans who enjoy shooting, archery and other such activities. The instructors are friendly, and the services are outstanding too. Knocknagoshel Shooting Grounds also offer group activities and team building sessions for corporates. Open throughout the year, you will have a great experience with the shooting range and this is recommended to all age groups as well. It was nice to shoot in Ireland but I will never do it again. This place is not cheap, and all I got was 25 rounds of 22lr and got to shoot it out of a 1911 chambered in 22. There is so much more that can be said as well. Great place for beginners and pros alike offering a large range of guns to purchase and also offering a rental scheme. You can choose between shotguns, pistols and bolt action rifles. The shotgun range is large and gives you the opportunity to go clay pigeon shooting with a guide. While there is also an inside range where you can move the target forward and backwards to test your aim. The staff are very friendly and are very well versed in gun control making you feel very safe. Overall its a great and not too expensive experience and would recommend to all ages.